A PHP Pie Chart script created by me using which any data and values can be represented using the pie chart. The PHP Pie Chart script is available for free download. By passing a query string you can compare any number of values. What follows is how to use my PHP Pie Chart Script and the code to download. The PHP Pie Chart script uses the following PHP image functions ImageCreate(), ImageColorAllocate(), imagefilledrectangle(), ImageFilledArc(), imagettftext(), ImagePNG() and ImageDestroy(). To edit the code you need to know how to use these functions. The zip file contains a True Type Font file named arial.ttf. This file is required by the script to display text in Arial font style. When you upload the PHP Pie Chart Script upload arial.ttf file too to the same location. How to use the PHP Pie Chart Script ? Remember to separate each value and name with a comma, and the values specified should be in the order of the names. You can use the implode() function of PHP to merge dynamically passed values. Take a look at the code below. It is a practical example of retrieving data from a MySQL database and representing it using the PHP Pie Chart Script. Did that code confuse you ? Let me explain things, we are connecting to a MySQL database (read Connect PHP with MySQL) and retrieving information from a table “marksheet” the names and marks of all students are stored in the arrays $sname and $smark respectively. The implode function joins all elements in the array into a single line of string separating them with the “glue” specified. Here the glue is comma (,) so the names become “name1,name2,name3……..nameX” and marks become “56,87,34,65,…….X” we place this string in the src attribute of the <img> tag. 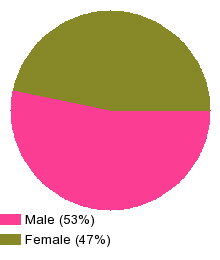 When the page loads this is passed as a parameter for the pie_chart.php script which dynamically “draws” the Pie Chart. All your doubts are welcome use the comment form below. I had cut out a “, god its always the little things. Thank you! Nice tool for adding a little sizzle to my project!! would you explain me more the img src part.. I added my website to the link in the example(print “”;) while opt and value is my database columns, but it returns nothing.